This CellML model runs in both COR and PCEnv to reproduce the published results. The units have been checked and they balance. 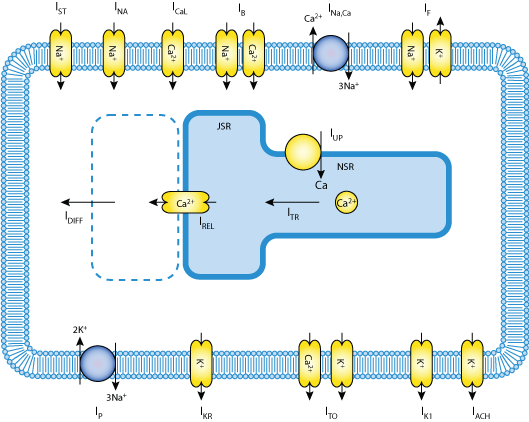 This version of the CellML model represents the atrio-nodal (AN) cell. The CellML model has been based on both the published paper and the original C++ code. ABSTRACT: Mathematical models are a repository of knowledge as well as research and teaching tools. Although action potential models have been developed for most regions of the heart, there is no model for the atrioventricular node (AVN). We have developed action potential models for single atrio-nodal, nodal, and nodal-His cells. The models have the same action potential shapes and refractoriness as observed in experiments. Using these models, together with models for the sinoatrial node (SAN) and atrial muscle, we have developed a one-dimensional (1D) multicellular model including the SAN and AVN. The multicellular model has slow and fast pathways into the AVN and using it we have analyzed the rich behavior of the AVN. Under normal conditions, action potentials were initiated in the SAN center and then propagated through the atrium and AVN. The relationship between the AVN conduction time and the timing of a premature stimulus (conduction curve) is consistent with experimental data. After premature stimulation, atrioventricular nodal reentry could occur. After slow pathway ablation or block of the L-type Ca(2+) current, atrioventricular nodal reentry was abolished. During atrial fibrillation, the AVN limited the number of action potentials transmitted to the ventricle. In the absence of SAN pacemaking, the inferior nodal extension acted as the pacemaker. In conclusion, we have developed what we believe is the first detailed mathematical model of the AVN and it shows the typical physiological and pathophysiological characteristics of the tissue. The model can be used as a tool to analyze the complex structure and behavior of the AVN. Schematic diagram of the Inada et al. 2009 cell model. Derived from workspace Inada 2009 at changeset 1cd9f1ff4db7.